Looks like I have some competition. I recently stumbled across the Near South Loop Master Plan, a design for a mixed-use, people-oriented development by MGLM Architects. While they’ve somewhat ironically nestled their construction around the conspicuously people-hostile Roosevelt Collection, on the conspicuously people-hostile Roosevelt Road, their plan would fill an important gap in the urban landscape in a terrifically forward-thinking way. It’s not quite as radical as a true small streets layout, but it features the right general principles: moderate-height buildings with inviting facades, with little wasted space between buildings. Of course, it’s unclear whether this development will ever come to pass. 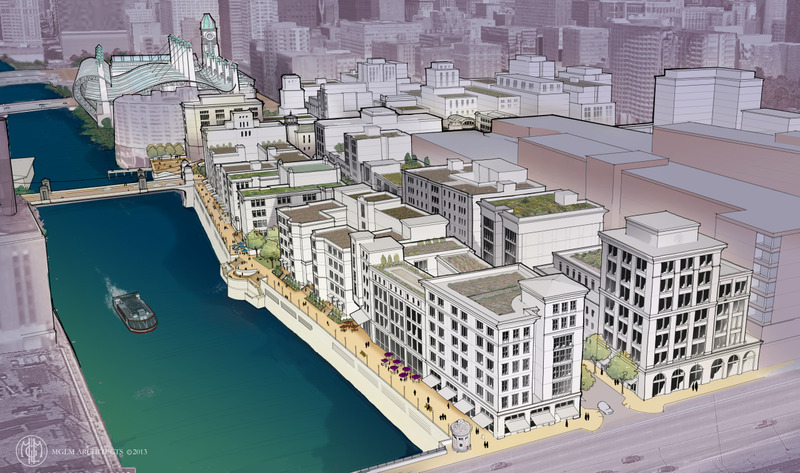 Arguably, their vision is as “unrealistic” as mine (the plan involves some pretty serious new transit construction), though being a professional architectural firm, they at least have prettier pictures. Still, I have some hope that this sort of development will be taken seriously by the city. The Emanuel administration, led by the efforts of CDOT Commissioner Gabe Klein, has implemented a surprisingly progressive transportation agenda (something I will eventually get around to blogging about). Promoting people-oriented development would be a natural complement, though I’ve yet to hear of any planned development along such lines. Since I’ve mentioned pretty pictures, I should add that I do plan to eventually put up some more detailed pictures of (a redesign of) Phase I of the Midway Village. I’ve been playing around with Google Sketchup, which seems to be a great tool for experimenting with urban space. While I don’t think I’ll be able to produce anything nearly as nice as MGLM’s sketches, I hope to at least progress beyond the existed jaggedy squiggles. This entry was posted in Midway Village, Small Streets. Bookmark the permalink.